Everybody likes to be the coolest kid on the kitchen knife block. 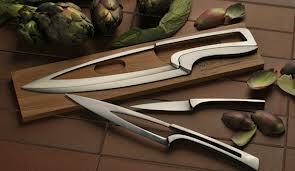 So for those who have spent hours and hours in the kitchen slicing vegetables and thinkng 'I wish my knives looked classier', here is the Deglon Meeting Knife Set. 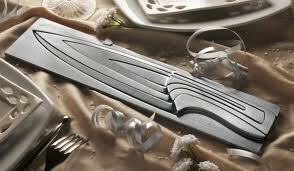 Want to see just what the latest kitchenware knife set has to offer? Walk this way. The kitchenware world is far from a simple world. New gadgets every day, and everyone trying to make a buck from ever more practical inventions, but sometimes it's just nice to have a piece of kitchenware which looks cool. The Deglon Meeting Knife Set consists of a series of knives, each of which fits inside the hollowed out middle of its larger knife set companion. Extremely space efficient as well as incredibly cool, this knife set is for those who want their knives to say more than 'I can cut a potato, no problem'. With a paring knife, utility knife, chef knife, and a slicer, wannabe chefs can rest easy in the knowledge that they have every type of knife needed. Whilst taking in the sleek and clever design of this knife set, the mind cannot help but wonder about a potential flaw. The large knife does not seem to have much...well....knife. What happens when you are slicing through something deeper than 1 inch? Innevitable practicality questions aside, it is clear that those who would be in the market to purchase such a knife set would also be willing to look past these flaws as long as they own the knives that everyone is talking about. Although carrying a slightly eye-watering price tag of $755.47, you certainly get what you pay for, and judging by the reviews this knife set cannot put a foot wrong when it comes to the competetive world of kitchenware. If you feel like sharpening your knife skills (who can resist that pun) and reading the stellar reviews then you can do so here. Unique Design From So Re Fa Eco-Fashion Show: Jacket That Converts Into Tent! Wal-Mart Greenwashing With Eco-Indexing System? Sleep Well, You Will, Young Padawan In Your Official Star Wars Tauntaun Sleeping Bag!